Description of "How to setup a Managed Services Business in 2009"
2009 will be the best year to start a managed services business as lot of SMEs get ready to let go their one man IT shops and look for inexpensive IT providers.If you are a VAR or a system integrator thinking of starting your own managed services business,this book is for you. Get the complete picture of how to register your business & manage federal procedures, raise working capital,cut costs on operations,win customers,and run a successful MSP business.Understand what works and what doesn't from the case studies and best practices compiled from hundreds of successful managed service providers. Dev Anand works with AdventNet Inc., a global IT management software development company, as Product Manager for the managed services division. He has held various marketing and product management roles in his 8 years of AdventNet life and is currently associated with the managed services market since 2006. He manages healthy relationships with more than 500 managed service providers (MSPs) worldwide who run their managed services business on top of AdventNet's MSP platform. He is a guest blogger in mspmentor.net and has done various analysis on the emerging trends of the managed services market and has shared his ideas and predictions for you to gain more competitive edge in your business in this book. He is passionate about user experience, design, and automobiles in general and has a strong belief in UFOs and aliens ! 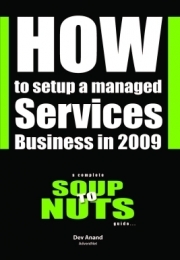 Reviews of "How to setup a Managed Services Business in 2009"